The Wheeling Alternative - Where did the 100,000 jobs and the $36 billion investment figures come from? West Virginia University researchers believe a Marcellus and Utica shale ethane storage hub could help create $36 billion in investment and more than 100,000 permanent jobs - some of which could occur at industrial sites left behind by Wheeling-Pittsburgh Steel, Weirton Steel and Ormet Corp.
100,000 jobs? That's a lot of job creation. Investment of $36 billion? If the reporting is correct, the study certainly looks good for the tri-state region. Unfortunately for the Ohio Valley, the WVU study doesn't mention any of the above. The reporter, Casey Junkins, who last year misrepresented a study on the retraining of coal miners to draw an opposite conclusion, once again makes claims for findings that are not in the study. In the United States, petrochemical projects are expanding. Industry investment and jobs have increased; the value of NGLs has increased; and fractionation capacity has increased as new processing plants come on line. That's it -- there are no other references to job creation or investment in the study. The French company that says its Houston-area chemical plant is spewing "noxious" smoke — and may explode — successfully pressed federal regulators to delay new regulations designed to improve safety procedures at chemical plants, according to federal records reviewed by International Business Times. The rules, which were set to go into effect this year, were halted by the Trump administration after a furious lobbying campaign by plant owner Arkema and its affiliated trade association, the American Chemistry Council, which represents a chemical industry that has poured tens of millions of dollars into federal elections. Yes, the American Chemistry Council is a very questionable source and given their reason for existence and history, it's not that much of a stretch to doubt the Council's conclusion that a storage hub would create 100,000 permanent jobs and $36 billion in investment. The Council's goal is to sell us on a storage hub and I don't think they're all that concerned about whether their means are ethical. What is unfortunate in this case is that those numbers will now be connected with West Virginia's research. Junkins' sloppy reporting has given credibility to what are certainly some very questionable claims. It should be noted that some newspapers did get the story right. The Washington (PA) Observer-Reporter's coverage of the event also included those figures but it's reporter made it clear that the numbers were part of the discussion afterwards and not from the WVU study. Readers of Ogden papers were not so fortunate. 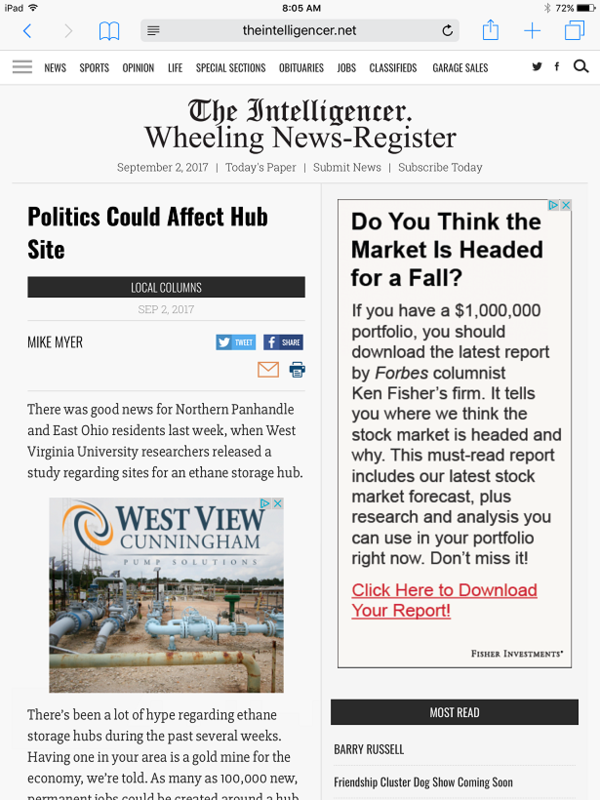 There was good news for Northern Panhandle and East Ohio residents last week, when West Virginia University researchers released a study regarding sites for an ethane storage hub. There’s been a lot of hype regarding ethane storage hubs during the past several weeks. Having one in your area is a gold mine for the economy, we’re told. As many as 100,000 new, permanent jobs could be created around a hub, WVU’s experts say. I think this is just the first of what will be many references to a WVU study that didn't even examine job creation. One of the longtime ethical concerns of those who study American media has been the wall that separates the editorial/reporting staff and its advertising. If a news source is to have credibility, readers/viewers need to believe that advertisers do not in any way influence what or how something gets reported. Along those lines, here is a screen shot from the online edition of today's Intelligencer where there doesn't appear to be much of a wall. My hunch is that one of the advertisers on this page will be happy.